It’s a perfect bound book that is very, very wide! 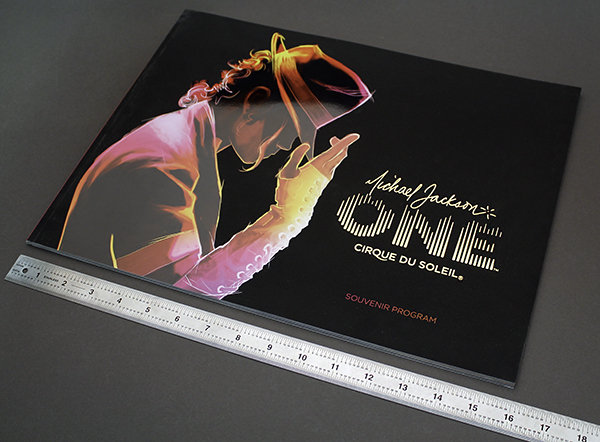 Width from spine (binding edge) to the face (where the pages open) can measure from 12” to 20”. 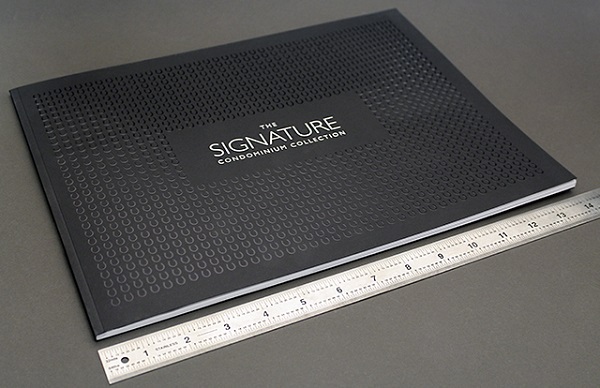 Why design and print a giant perfect bound book? It grabs and retains attention! It is the wide, oblong or landscape style look that really impacts people. 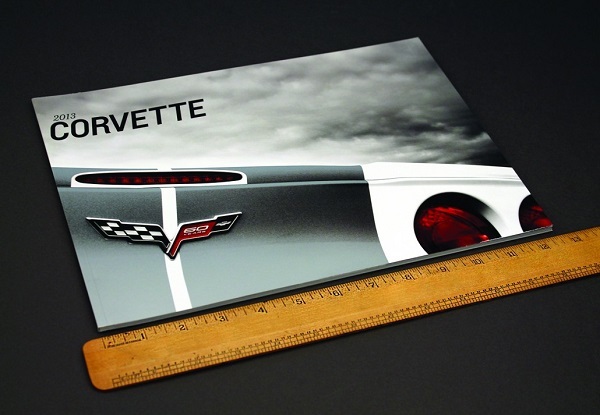 Most people have never seen a perfect bound book with widths from 12” to 20”. 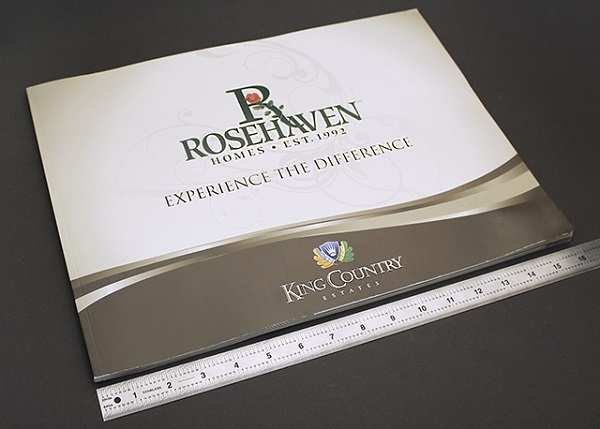 Most of the giant books we have produced are sales tools or marketing collateral—particularly to sell high-end homes, condos or buildings. A real estate agent in Miami was the ultimate client and our client, a Boston-based printer, needed 3,700 giant perfect bound books in a ridiculously tight time line—and we did it! 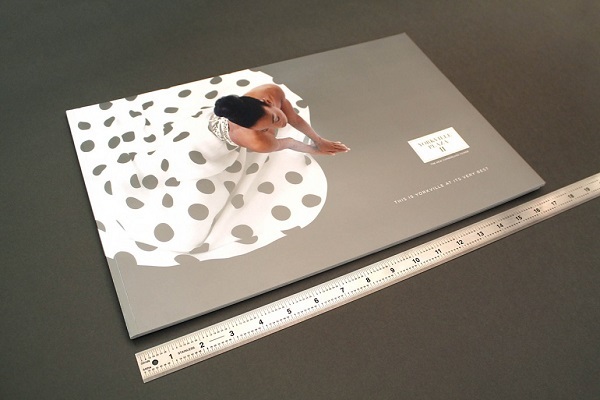 In house, we have produced quantities from 30 to 30,000 giant perfect bound books. Allows for more dramatic use of photos—bigger range of photo sizes and placement. Book is memorable and far less likely to hit the recycling bin. Book often becomes a ‘coffee table book’ because it does not fit on a regular bookshelf. Because the book is likely to be on a table or desk, it is in plain sight and is viewed more often. Glue for binding giant perfect bound books MUST be P.U.R. Please stop by our showroom at 946 Warden Avenue (just south of the 401) to see samples. Because of size reasons, we cannot send samples of this product.